I’m trying extremely hard to stay out of the comentariat concerning education. My love is instruction, not politics. Students, not funding. Engagement, not class sizes. So with that in mind, let’s take a look at this graph presented by Bill Gates. Now, I’m not an economist, so can one of you out there that is redraw this graph to include inflation? Is the slope of the line steeper or less steep than the spending line? This is not a trick question, I have no idea. I don’t even really know how to properly quantify inflation even if I knew what it was over the past four decades. Addendum. I guess I should clarify this first: have these numbers been adjusted for inflation already? Anyone? Bueller? Will do some more exploring later, but according to the site, $5000 in 1975 is worth $19900 in 2009. Seems a little high, right? But maybe. I need to talk to an economist. Look up “Price Index” in Wikipedia. Safe to say that the average price of goods has more than doubled in the last 40 years. 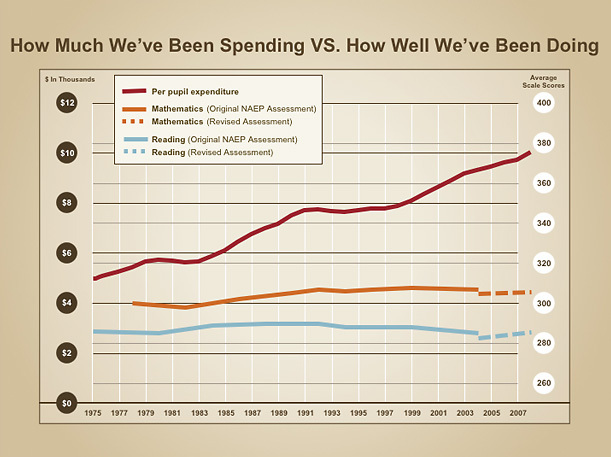 If the above graph has not been adjusted for inflation, then it appears as though we are actually BEHIND in per-pupil spending. My gut tells me this graph HAS been adjusted for inflation. But I can’t be certain about that. This post suggests, probably rightly, that comparing two countries in terms of education spending is misleading. For instance, employee health insurance costs are usually not tabulated in countries that have single-payer coverage. Kevin, did you check out the “correlation” tab on that link you sent me? I spent an hour looking at it.